Click here to see the assortment of online programs and assessments to strengthen the skills of your employees to better manage, communicate, and supervise as well as to improve their work on teams and with customers. Topics include Everything DiSC, Five Behaviors of a Cohesive Team, management, sales, customer service, stress, diversity, leadership, time mastery and more. Click here to review the variety of assessments available to help you hire the employees who match up the strongest for your positions and company culture as well as to coach your employees and provide a complete 360 feedback program for strong development and communication within your organization. DuPont Sustainable Solutions offers CoastalFlix™ which brings the classroom to you. Whether it's in a workshop, at a desk, in the field using a mobile device, on site or off site, with the CoastalFlix™ video streaming solution, your employees can experience compelling DuPont content via any web-enabled device. Why CoastalFlix™? From the classroom to your laptop to your mobile device, CoastalFlix™ gives you the flexibility to deliver a compelling learning experience anytime, anywhere. Get instant access to hundreds of streaming videos on the latest safety, compliance and human resources issues. Get instant access to hundreds of streaming videos on the latest safety, compliance and employee development issues. Click here for the programs available to you. 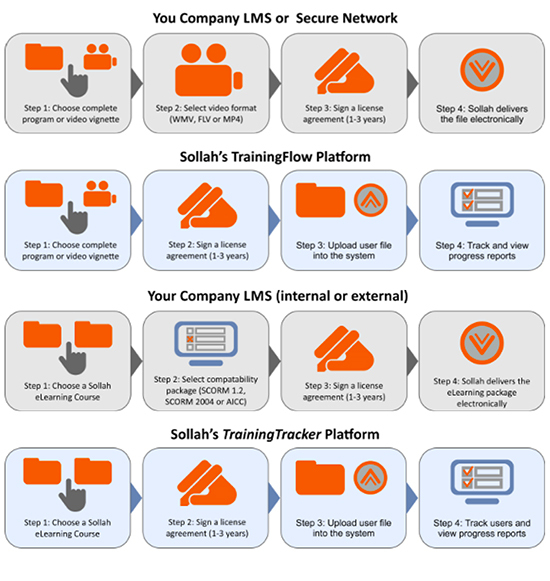 Sollah Interactive's award-winning programs deliver high-impact training to help an organization create a high-performing workforce. If you know the title you are looking for, search now to learn more about it. "Build" customized training programs through the use of award-winning video vignettes as well as "Blend" into your existing training programs/curriculums. TAG™ a cloud-based platform (Training Assets Gateway™) is accessible 24/7 which allows organizations to preview, select, organize, download and train. Sollah Interactive, the producers of TAG, offers complete flexibility with the use of these vignettes along with making available "off-the-shelf" complete training programs for the classroom, eLearning and Just-in-Time training. TAG is a unique cloud-based library that provides thousands of award-winning training components including: ready-to-use video-based full comprehensive workshops and eLearning courses - so when you need to develop new training or refresh, enhance or build upon existing - everything is at your fingertips without spending more money. You have complete flexibility by embedding the assets into PowerPoint, stream or place on your LMS. Understanding that budgets have been cut or slashed, we've made pricing very simple. There are NO hidden costs and NO trainer/facilitator certifications required. You can license the entire library or license what you need. You only pay for what you need. It's that simple! TAG contains video vignettes (short dramatic behavior-modeling videos), complete programs (ready to use training solutions), video introductions, video summaries, SMART-STARTs (jump start training or meetings), case studies, training activities, trainer resources, subject matter expert interviews and eLearning programs. The vignettes are available in multiple languages such as English, Chinese Mandarin, Korean, Polish, German, Italian, Hungarian and many more! The assets are specifically designed to address key areas such as ethics and compliance, inclusion and respect, talent development and so much more. These assets come in the form of video, facilitator guides, participant materials, workbooks, case studies, activities and more - all available and delivered electronically!